iOS 5.1, released this past Wednesday, brought a few additional features, but you might have missed a subtle new one if you’re not a heavy user of the Reminders app introduced in iOS 5: Your device will now alert you if you’ve got a currently active geofence. A geofence is a perimeter that triggers an alert when you pass through it. In the most common example, you set a reminder to do something when you leave or arrive at a location. As of iOS 5.1, your device will now show a hollowed-out arrow in the status bar to signify when you have an active geofence. 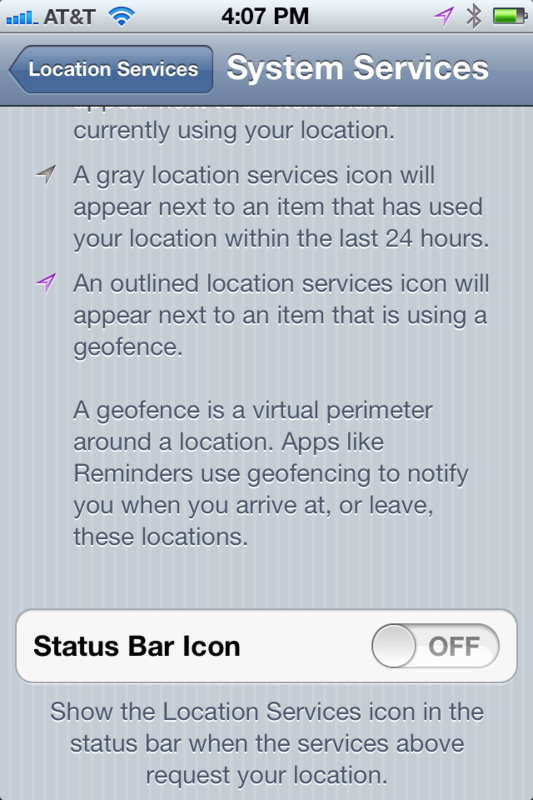 Similarly, that icon will appear in Settings -> Location Services next to any app that is currently using a geofence. 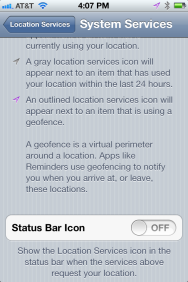 And, at the bottom of that Settings screen, Apple even takes the time to spell out just what a geofence is. Thanks to privacy concerns, Apple has become increasingly diligent about letting you know when an app is currently accessing your location. Starting in iOS 4, Apple began providing a list of apps that have requested access to your location, along with the ability to turn disable that information on an app-by-app basis. In iOS 5, the device even allows you to switch off certain system-level features that use your location, such as location-based iAds, traffic data, cell network searching, and so on. It could be this is simply a matter of Apple protecting itself against the next round of privacy complaints, or it could be that geofencing is poised to become an even more significant feature in a subsequent iOS update. To date, Reminders remains the only app I’ve seen that uses geofences, though apps can ask for location information in the background. I’d certainly like to see more apps take advantage of geofencing. For example, my phone already knows when I’m home—it’d be great if I could set it to, say, not use a passcode while I was in my house, but enable that higher security when I left. Or it could let me know when I’m near one of my friends, using Apple’s Find My Friends app. Android already has apps that deactivate Wi-Fi when you leave fenced locations, potentially saving you battery life as your phone constantly looks for Wi-Fi networks. Location-aware technologies have enriched many smartphone experiences, and it seems as though geofencing is one way to enhance those capabilities going forward.